This game is for brave guys. Well, are you such one? Then do not waste your time and try to avoid all the obstacles here. Clone yourself and that will help you. Do not forget to use the gun and stay alive as long as possible. You will cope with it, have no doubt. Just imagine that you are alone, obviously the only left after an incident occurred at the secret Infinity Inc. And you know must find a way out the big building immediately. Well, but ahead there is still a long and dangerous path, which is paved with deadly traps. 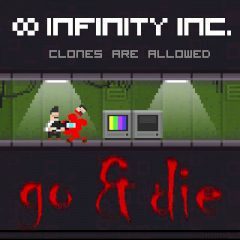 That is why, you will have to use the clone gun to reproduce yourself as you sacrifice your clones to pass all danger inside the Infinity Inc. So, everything depends on you right now. Just use all the skills and try to survive in such a cruel place.